The Crystal Tower is a Rift weapon and is part of the Riftwalker Set. By utilizing raw Rift crystals and advanced technology, intrepid hunters have attempted to create a trap capable of harnessing the indomitable powers of the Rift. Being such a foreign power, the trap is barely able to hold itself together, but thankfully it retains enough control to not immediately destroy itself and instead allows the hunter to focus its power to retain a hunting edge within this dangerous alien landscape. When smashed with the Hunter's Hammer, you'll be able to recover a delicate but powerful Shattered Rift Crystal, which you can use to build one of two new amazing Rift Power traps! The Crystal Tower can be purchased for 4,900,000 gold and 1 Raw Rift Crystal from the Gnawnia Rift Trapsmith. The Crystal Tower (if unintentionally smashed) can be reassembled from a Shattered Rift Crystal. Focused Crystal Laser – Upgrade built from Shattered Rift Crystal obtained by smashing Crystal Tower, with emphasis on power. Multi-Crystal Laser – Upgrade built from Shattered Rift Crystal obtained by smashing Crystal Tower, with emphasis on luck. Smashing this weapon with the Hunter's Hammer yields a Shattered Rift Crystal. 25 March 2014: The Crystal Tower was the first Rift trap and was released with the introduction of the Gnawnia Rift. 5 September 2014: The Cryst-HAL Tower Skin was introduced. 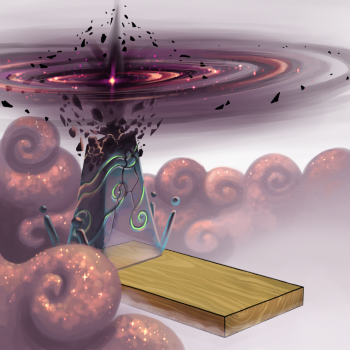 9 September 2014: The Crystal Tower became smashable and craftable with the introduction of the Burroughs Rift.